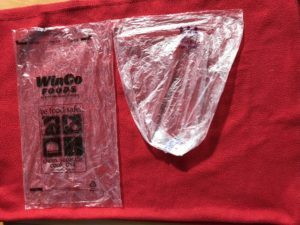 In the photo below are plastic bags used in the produce departments at WINCO (employee-owned, discount grocery chain) and Fred Meyer (Kroger-owned). The larger bag is from WINCO; the smaller is from Fred Meyer. Which grocer do you think sells the most produce? It seems likely that some financial person at Kroger decided to reduce costs by buying smaller bags. If you were in charge, what would you do about these bags?